The following instructions describe the installation and capture process using the SIIG 1394 DV-CAM KIT hardware and ULEADVIDEO STUDIO 3.0 software for use with the Ariel Performance Analysis System (APAS)/Microsoft Windows 98-Second Edition computer systems. The following hardware/software is recommended for Digital Video capturing/editing. f.Windows 98 Second Edition or later. Follow the directions outlined in the SIIG 1394 DV-Cam Kit Users Manual. The SIIG 1394 hardware is fully compliant with PCI Plug-n-Play 2.1. 2.This will open the UleadVideo Studio capture/edit software. 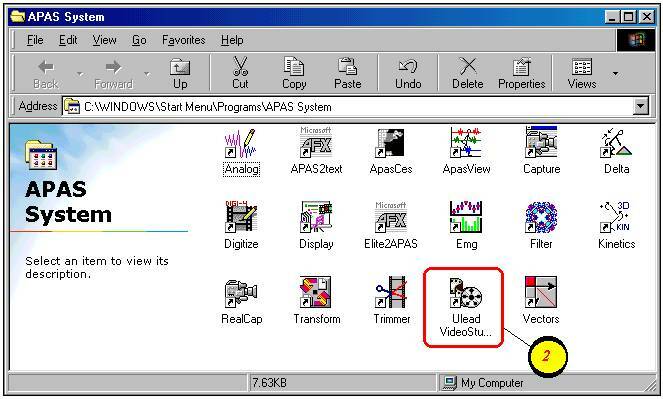 Double-click on the UleadVideo Studio icon located in the APAS-System folder (or on the Windows desktop). 13.The next step is to trim the captured video using the Ariel Trimmer module. The user may choose to rename these files with a more descriptive name prior to performing the digitizing process. The captured AVI files are labeled sequentially (using the first 4 letters of the project name) and are stored in the location specified in Step # 5b. Select the CAPTURE menu located at the top of the screen and repeat steps 6 through 10 to capture additional camera/control views. 10.Save the captured video file. 6.However, the image can be viewed directly from the camcorder LCD display or by using an external monitor connected to the S-Video Out connector on the camcorder. The recorded image will not be displayed on the Ulead monitor until the Capture button is selected. NOTE: the video.PauseThen Use the mouse and click the VCR buttons to position the videotape prior to the desired starting point. c.Refer to step #4 above for instructions on changing the template/codec settings. with either the Indeo 5.04 codec or the Morgan Multimedia MJPEG codec. AVI, 720x480 resolution, 29.97fps, DV, NTSC The recommended template for the JVC GR-DVL9500 digital camcorder is Select the template with the desired settings. b.In this case, the E: drive has been reserved for storing the video files. The hard disk drive on computers supplied by Ariel Dynamics is partitioned into several logical drives. :NOTE Type the name, subject, path and any other descriptive information. 5. icon.New ProjectSelect the a. Create a New Video Project. 4.Once the desired codec is set, it remains in the template until changed by the user. Change the selected codec. This step is only required a single time. 3.Once the Device control is set, the device control remains in memory until changed by the user. This step is only required a single time. Set the Device Control. Generated on 4/25/2019 11:09:46 AM (PST) ADI/HQ/GBA/2019/ARIELCLOUD/v3.0.2018.0126.